When you’re looking to upgrade the exterior of your home, turn to the experienced professionals at A. Clark Roofing & Siding LP. 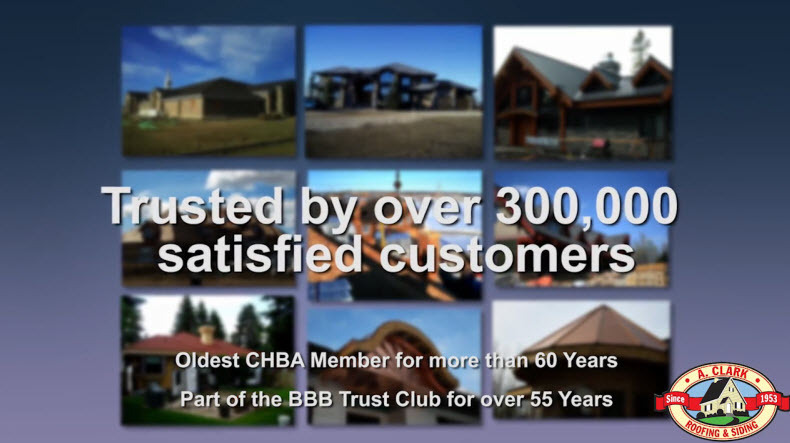 Based in Edmonton, we have completed installation, renovation and repair projects for homeowners throughout the surrounding St. Albert and Sherwood Park communities for over 60 years. We understand that your home is an investment, and we will make sure that all renovations had value to your property. A very good experience with this company. They showed up when they said they would, and the workers were very pleasant. They took all their mess with them too. We are very happy with our new roof! Amazing Company, Great Team, Perfect Results!! I Highly Recommend A Clark for all your exterior needs!! Elmer the estimator calls. He tells us what needs to be done. The crew arrives. Totally professional Experienced. Friendly. Yes, I would recommend A. Clark Roofing (Hey, thanks Elmer!). The installation was incredibly slow but looked amazing when it was finished. Until... tiles began falling off. The repair people said most of the tiles were just sitting on the roof and were never installed correctly. Flash forward to 7 years later, many phone messages and promises of repairs, a leaky roof and more tiles falling off, and still nothing. It is easy to give great warranties and promises if you push everything off after the cutoff date. Beware of this company! So, far this is the best roofing company I've ever worked with. I've been contacting companies since January and Aclark was one of those company who made a quick response. I like the team because they were very accommodating and professional in handling clients and their job. These guys were totally awesome. I had a really bad shingle problem this summer: most were buckled and we soon found out that the layer under the roof was filled with mold. Credit to these guys for their fast service and affordable prices. Looks like roof problems this fall and winter will be nonexistent!